For both feral and domestic swine, stress is a routine part of life and occurs in the context of social dynamics (feeding, mating, aggressive interactions) and coping with the environment (heat, cold and novel environmental situations) There has been a lot of research done regarding pig behaviors and their overall welfare. Pigs’ natural tendency to chew objects in their environment can be misdirected at other pigs. Van Putten (1969) reported that ear and tails are the easiest targets, but ear chewing is more likely to provoke an attack than tail biting. Various strategies have been used for countering tail biting, including providing materials to allow natural biting, rooting and play behavior. Blackshaw et al. (1997) evaluated fixed toys hanging from the ceiling and free toys on the pen floor and found that neither affected relative growth rate, but both affected pig behavior by reducing aggressive behavior (tail biting, fighting, etc.). On the other hand, some studies report that the presence of enrichment objects can lead to agonistic behaviors (Van de Weerd et al., 2006; Day et al., 2008), perhaps resulting from increased competition because of spatially limited access to a particular object (Docking et al., 2008). The novelty of an object is important for initiating exploration and has been reported to be intrinsically rewarding to pigs. However, loss of ‘novelty’ occurs rapidly as pigs become habituated to objects. What does this mean? You need to change the enrichment activities up. Pigs get bored much like children get bored with playing with the same toy day after day. Have a rotation schedule so your pig doesn't have the same toy more than a few days before you switch it out for something else. Enrichment strategies, such as providing objects suitable for chewing and rooting, may present a stimulus or route for eliciting and reinforcing exploratory activities involving the snout and mouth (Van de Weerd et al., 2003) and result in a reduction in adverse behaviors, such as tail-biting and belly nosing (Fraser et al., 1991; Peterson et al., 1995). For example, providing growing pigs with straw is considered to reduce harmful social behavior, such as ear and tail biting, and to increase behavior directed toward the straw bedding (de Jong et al., 1998). An experiment by Beattie et al. (1993) showed that growing pigs housed indoors and given a substrate in which to root increased the amount of time spent exploring and decreased the time spent in inactivity or in behaviors directed toward their pen-mates, such as chewing ear and tails. These behaviors would also include pigs biting at their human parents. Enrichment seems to go far in the mind of a pig. Bored pigs tend to act out whereas pigs who are intellectually satisfied tend to be more relaxed. ​Click here to read more about enrichment activities and toys that can be purchased to help you keep your pigs mind occupied. Aggressive Pigs: How do you work with an angry pig? Aggression in the "pet pig" is a significant concern and results in the abandonment or rehoming of many pigs before their 1st birthday. No aggression towards humans should be ignored with the hopes that it will just go away or get better on its own. As is the case with most behavior problems, aggression rarely decreases without treatment and usually worsens over time if left untreated. Pet pigs usually start displaying signs of aggressive behavior as they mature socially (6 months- 3 years old) and typically, the 1st victims of the aggression are visitors to the home. This is believed to be the normal response to an unfamiliar individual, similar to to how pigs act when meeting another pig for the first time. Aggression to people in the home tends to happen during that same timeline mentioned above, 6 months-3 years old and is usually a form of dominance aggression. While many people, trainers and behavioral experts have their own opinions on how this should be treated, the common factor is that it SHOULD be treated and not ignored. The pig needs to be taught that the humans are the leaders of the group. Lets clarify something right out of the gate, pigs are not born mean or aggressive, someone (or sometimes many people) have made a pig mean and aggressive. This is usually a result of lack of training and/or lack of neutering/spaying. 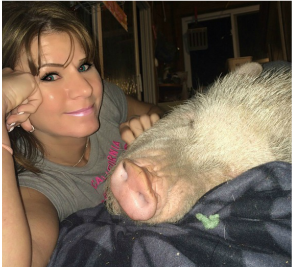 If hormones are the driver of the aggression, the very first thing you need to do is schedule this pig to be spayed/neutered. Hormones can be an awful beast and you will be fighting an uphill battle with this pig. The second kind of aggression is much milder, but still needs to be addressed, I like to call it, spoiled pig syndrome. I also want to add, it's likely this aggression didn't start off with charging and biting. I haven't had the one I am working with now since he was a baby, but I have had several pigs in my care over the years and have found that the aggression usually starts off mild, maybe nipping the fingers or head-swiping when your pig is aggravated and sometimes starts off as food aggression (which you can read more about by clicking here) Maybe even charging people when they come into your home, but not actually doing anything to hurt anyone. If this is not corrected, it WILL get worse. Your pig will continue to try and dominate people until he/she feels like he/she is the #1 herd leader. Pigs will usually choose the weakest link first to move up the chain of command until finally he/she gets to the top spot. The weakest link is usually the other pets, the kids, perhaps an elderly relative who lives with you or someone in the home who isn't always actively involved with the day to day care of the pig. Take control of this in the beginning so you don't have to struggle with an aggressive pig. For now, we will address major aggression and I will start by sharing my experience and how I addressed the problem. Remember, you can NOT reward negative behavior, but you SHOULD reward positive behavior. 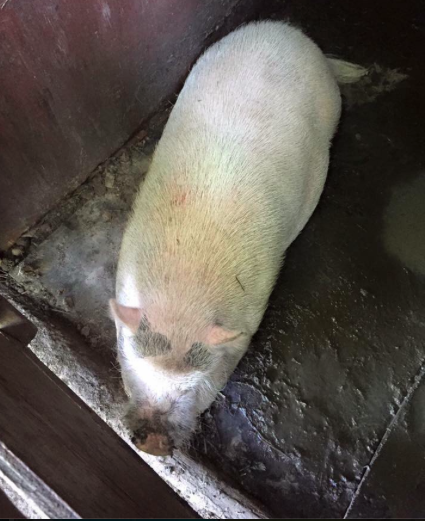 ​I received a text message from a friend saying someone had dumped a pig a couple of blocks away at an older man's house who wasn't able to care for his own animals, much less a pig. I visited with this pig on the first day, took some feed and veggies to him and went to see what his general disposition was. The older man had dementia and animal control was also there because his horses were being seized the next day due to his inability to care for them. They made the ultimate decision to euthanize this pig. Having a pig myself, and having one pass away years ago at only 9 months old, I could not, in good faith, allow the city to euthanize a healthy animal. So I spoke to the animal control officer and let them know I had a pig and was knowledgeable about pigs and would take him to my home and get him neutered and cleaned up and would find him a good home. And that was my intention. This is the first picture I got of this pig that needed a home or would be euthanized. I went and saw this pig, he wasn't neutered and had a bit of an attitude problem, but overall, something I could manage. A couple of days later, he was on his way to my house. he was dirty, full of worms and a horse had bit him at the temporary house he was at. He wasn't thrilled about going to yet another house, but ultimately, I believed we would work it all out. Just getting him to eat pig food was a challenge because he had been fed dog food his whole life, I like to refer to dog food as "pig crack". I ended up having to mix pig pellets with favored oatmeal and yogurt for the first few days. Gradually, I removed the oatmeal and yogurt and replaced it with fresh veggies. After several weeks, he did start eating pellets without a problem and he came to love them. ​I have seen, mostly with intact boars over long periods of time, the behavioral issues become a part of their routine and even after being neutered, the behavioral issues continue. The behaviors that have become a normal way of life for these pigs don't magically go away after being neutered. An older pig, with aggression or other behavioral issues, needs time for the hormones to level out and normalize before you are able to retrain this pig. The hormones can take a longer time in older pigs to return to normal levels and not be in the crazy-hormonal animal mindset. Nonetheless, fighting against hormones is like fighting an uphill battle. You can certainly train an intact pig, but you cannot trust one. Normally, pigs that remain intact after being in a home as a companion pig, are most often the pigs that will later need to find a new home because the people are not able to manage this pig and do not fully understand pigs or the importance of spaying and neutering. 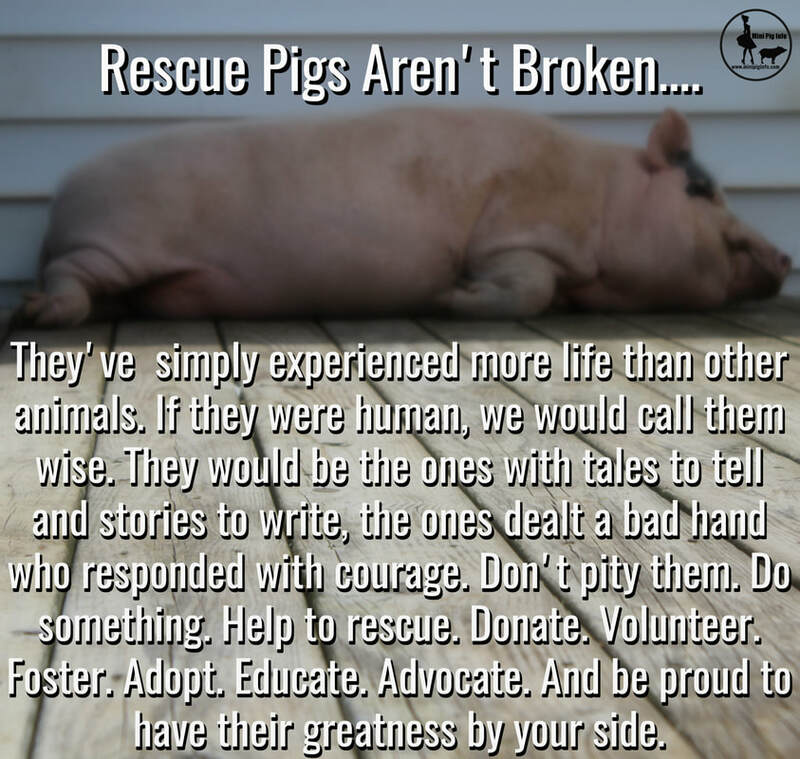 Often times, these pigs are set up for failure because being placed in home after home or foster to foster, they do not have any stability and this confuses and upsets them even more. It is especially bad in cases where a pig is rehomed on something like Craigslist and the new family also doesn't understand pigs or have the knowledge base to know that a neuter would be helpful. I have heard from some pig family's who say they were told if there is no other pigs, theres no need to spay and/or neuter. This could not be further from the truth! ALL pigs are at risk for developing potential life threatening tumors in the reproductive organs, deadly infections and/or behavioral issues. A spay/neuter eliminates the possibilities of these things occurring because of the reproductive organs remaining in place. Untrained pigs are often inconsiderate and lack manners and respect. This means they do not respect you, your attempt at asserting your authority and in my experience, they tend to also be territorial as well. Each pig will come with its own set of baggage and some pigs will be able to handle things better than others, but in worst case scenarios, these are the things that can (and often do) occur. Be prepared for a challenge. Be ready for a pig that isn't willing to let you be the leader. Prepare yourself for the worst possible outcome. But, also know these problems can typically be corrected. It is NOT an overnight process and will take patience and time though. In some cases, an intact older boar can be dangerous. Typically, with the older boars (which is the term for an un-neutered male pig), they also tend to have longer tusks and while they are usually self-aware of their tusks, they can use them as a weapon. Teeth grinding is common for pigs in general, but when grinding their teeth, intact pigs are also sharpening their tusks. These tusks can protrude from the lips or they may be hidden under the lips, but ALL pigs have tusks. Intact pigs normally have tusks that grow a bit quicker due to the surging testosterone, once neutered, the growth slows but continues throughout the male pigs life. It is thought that a female pigs tusk root eventually closes and the growth stops, but this isn't the case in the male pigs. I only say all of that to stress the point, be careful. Always use something to protect yourself, never turn your back on a boar. I don't say this to scare anyone, but, more from my personal experience. You can't be blind or ignorant of the possibilities, trust them too soon or have unrealistic expectations and you need to be aware of all the possibilities. Back to the challenging boar I rescued, we named him Huckleberry. Huckleberry did great for the first 3 days he was at my home. At one point, my other pig did accidentally get let out at the same time despite our careful planning and rotation of the yard, but surprisingly, the two pigs got along beautifully. They didn't bicker or fight, he was not aggressive or mean to her though she was a bit shy of him. On the 3rd day, my vet came over to vaccinate him for the normal pig diseases/preventative purposes, including tetanus, so we could schedule his neuter. Unfortunately, his tetanus vaccine had to be given 4 weeks prior to his surgery date, so we scheduled a day 4 weeks later for his neutering procedure. The day after my vet vaccinated Huckleberry, he turned into the meanest pig I have ever seen. As soon as I stepped outside, he started challenging me. At one point, I was trying to give him fresh water, but he was standing on the water hose, I gently nudged his shoulder to encourage him to move 1/4 of an inch so I could get the hose where I needed it to be and before I knew it, I had blood running down my leg. He had "tusked" me. Did he do it on purpose? Does he want to hurt me? Will he do it again? I didn't know the answer to any of these questions at the time, but later learned what I did wrong. ​This was my first mistake. I didn't push him, but I did nudge his front end so I could get the water hose out from underneath of him. My second mistake was trusting an unknown pig too soon. I had no history on this pig other than 2 people from my area saw him on Craigslist being advertised as "free" because the family he was with couldn't deal with him anymore and would be letting him run loose or killing him if someone didn't come get him. These two people went and got him and made arrangements with a home owner to care for him. They weren't in a position to care for the pig themselves and also weren't aware that the man they had made arrangements with to care for this pig had a medical condition that impacted his ability to make decisions for himself. Ultimately, I was starting from scratch. No medical history, no vet records, no idea of what kind of issues he may have had when he lived with his first family. Lesson: NEVER trust a boar! Never push an intact pig, even gently nudging an intact boar is challenging him to a battle. An intact pig, and I assume an aggressive pig in general, will assume you want to fight when you attempt to move them physically with your hands. If you have nothing there to protect yourself with, you are leaving yourself extremely vulnerable and you can expect an extreme reaction from this pig. That may be by charging you, headswiping, jumping up on you, biting, or overall, positioned in an aggressive pig stance. This stance is usually hunched back, mohawk up, chomping the mouth, frothy mouth, side stepping and sometimes even circling you in an attempt to find a way or position to attack. Sometimes a truly aggressive pig will have all the classic characteristics and do these things faithfully when he/she plans to attack or is upset. Some pigs may turn and attack out of panic, some pigs may bite our of fear, but this is much different from an aggressive pig. A biting pig is usually a result of something specific, such as you stopped giving treats and that pig wants another or a pig is used to being handfed treats and sees a hand and assumes it has a treat in it. Some pigs do not appreciate someone rearranging their perfectly organized sleeping quarters or "hoarder corner" as we call it at my house. Again, this does not mean you have an aggressive pig, this means your pig is upset. An aggressive pig isn't soothed by a belly rub, you won't be able to talk in a calm voice to reassure an aggressive pig into acting reasonable. You can do these things with a pig who is upset. That is the difference. ​This was my leg after his 4-5 inch tusk pierced through the skin and calf muscle on day 4 that he was with us. I ended up needing antibiotics because it became infected within 24 hours despite the intensive irrigation and cleansing I did. Now, I will admit, I was scared of this pig at this point. He isn't nice, obviously hates me, scared, sad, mad, confused and NONE of this is his fault. You have to know how the herd dynamics work in order to understand why they act the way they do. ​The attacks got worse day after day until finally, we weren't able to use the backyard unless this pig was penned up in our small pen beside our garage. I know there is a good pig in there somewhere, it is obviously buried deep down inside somewhere and he needs help finding it again. I purchased a sorting board or sorting panel, as some call it, to protect myself from this pig. This is actually the most important tool I feel EVERY pig parent should have in their tool box. A sorting board isn't punishment, it isn't to make your pig to anything. It is used to set your pig up for success. It is designed to stop a pig from being able to make physical contact with you when needed. However, you cannot leave it somewhere and run to get it. The moment you back away from an aggressive pig, he won. He is now directing YOUR movement. Sorting boards can be used to help guide a pig to an area you need an unwilling pig to go to. They can be used to break up a pig fight amongst each other, technically they can be used for anything you need a sturdy flat plastic board for, but ideally you will make sure its available wherever you may be when you are dealing with an aggressive pig. Every single day, he would run up the steps to the deck when he heard the door open with his mohawk raised, constantly chomping his mouth, frothing at the mouth as if he were a rabid animal, and side step in the classic attack position. In the beginning, I didn't know what to do because I've never had a fully grown, adult, intact male pig try to attack me. Huckleberry would get a running start and try to leap over the sorting panel to try and get at me. Relentless is the understatement of the year. He would constantly head swipe and appeared as if he was trying to use his tusks or headswiping motion to get my attention. Eventually, I locked him in the pen for a week to try and let him know the behavior was unacceptable and also to see if absence makes the heart grow fonder. (It doesn't, by the way) Actually, I tried several methods and suggestions and they all failed. I was fighting a losing battle with hormones. This went on for some time. His neuter was scheduled for 4 weeks after his vaccinations.....we are vigilant about making sure he is contained in a crate while in the house and penned up when outside. There is no way to reason with a hormone driven crazy pig. There is no reason to risk anyones safety when dealing with an animal like this. You owe it to yourself, any potential guests and the pig to take appropriate precautions so your pig isn't put into a position where he/she can hurt someone else. That isn't fair to a pig who is given opportunities to hurt someone to punish him for doing what you already knew was a potential to happen. Finally, it came down to the day of the neuter. Although it was a nightmare getting him loaded in my SUV, we did finally make it to the vets office. Unfortunately, they had some equipment malfunction issues and weren't able to do the neuter after all. I called several vets locally and no one was able to help with the neuter in the hottest part of the summer because of the risk for malignant hyperthermia. Pigs aren't able to regulate their body temperature for several hours after a medical procedure when anesthetized and no one had a stall that was temperature controlled. So his neuter was put on hold until I could find a willing veterinarian to do the procedure. Eventually I was able to find a local vet that agreed to neuter an aggressive grown pig (and do a tusk trim) and again, it was a nightmare loading him into the SUV, but we made it there and he was a sweet angel for the vet staff. (I also took a meal to the vet's office so he could eat afterwards and not be a mean AND hungry pig....this was a mistake because once he was able to come home, we got stuck in traffic and he defecated and urinated practically the entire way home, in the back of my SUV that I still have 4 years of payments left to pay. Just not a good idea, your pig will not starve while recovering, or during the drive home or once you get home. I wouldn't advise anyone to take their lunch to the vet unless they had to stay overnight or the vet felt it would be best if your pig ate while there, I only did it because I didn't want him to hate me for anything else-just wanted to share that tidbit for anyone who may be able to learn from my mistake.) Nonetheless, the neuter was done!!!! I knew the hormones wouldn't die down overnight, but I was still hopeful for some immediate improvement. He was back to his normal aggressive self. Actually overnight, he pushed the crate and bent it and was standing outside of it looking at me when I came down the stairs the next morning. As soon as he was let outside, he peered into the glass on the door waiting to eat. I took his food out to him and as soon as he was done eating, he ran to me headswiping....only this time, I knew he had a tusk trim, so I wasn't that concerned...until he connected with my leg. Never let a tusk trim fool you into a false sense of security. The nubs left over from the tusk trim still hurt and the powerful head swipe from a hormonal pig isn't something to mess around with. He was still attacking, he was still charging, he was still head-swiping and still had aggression issues. Eventually, I make the decision to pen him until his hormones have a chance to normalize. This is heartbreaking to me because I have seen the good pig that's inside of this mean and hateful pig, It's tough to love a pig that hates you so much. I tried treats, I tried to be super kind, I tried working with him and training him but all he seems to be interested in is hurting me. This penned up idea lasts for a week and I decide to let him out and see how he does. The first day, he does better, but gradually works back into his super aggressive behavior. So I limit the amount of time I work with him because he's relentless and not backing down and shows no indication that he plans to. I have sorting boards at every door and notes telling people do NOT go out back without a board because the pig will attack and they will likely get hurt. (Let me add, I take special precautions when I let him out of the pen for yard time. I make sure the gate is locked, no one is planning to go outside and if they are, I have notes on every door to let everyone know that he is out of the pen and in the backyard. I do not want to put him in a position to hurt someone. If he is put in that position, that would be 100% my fault. I know he has behavior issues which is why I am the ONLY person who works with him. By this point, I know this pig. I know his next move before he makes it. I have hundreds of videos that i study to be able to predict what he will do next. I also know that very few people are equipped to deal with an aggressive pig. I was NOT initially equipped to deal with him, but I got a life lesson when I made the decision to bring him to my home) Thankfully, all the dedication to protecting him and others pays off and no one else (besides my tusk incident discussed earlier) is injured as a result of this pig or his aggression. Fast forward another 4 weeks and we are FINALLY making progress. And I already knew it takes several weeks in an older intact pig for the hormones to die down and drop to levels that are appropriate for interaction, as I stated above, but I was hopeful he would be the pig who didn't follow the normal rules and quickly become a great loving pig. I was obviously wrong and set myself up for disappointment. This is how I did it. You need a sorting board, this will be a lifesaver. There are several types and sizes. If you have a grown, older, bigger pig with an attitude, I suggest you get the bigger one. Pigs that are aggressive like that usually are stronger than you realize and a smaller board can easily be moved or tossed to the side leaving you unprotected and vulnerable. Always wear boots, preferably rubber boots that may give you just a little added protection. 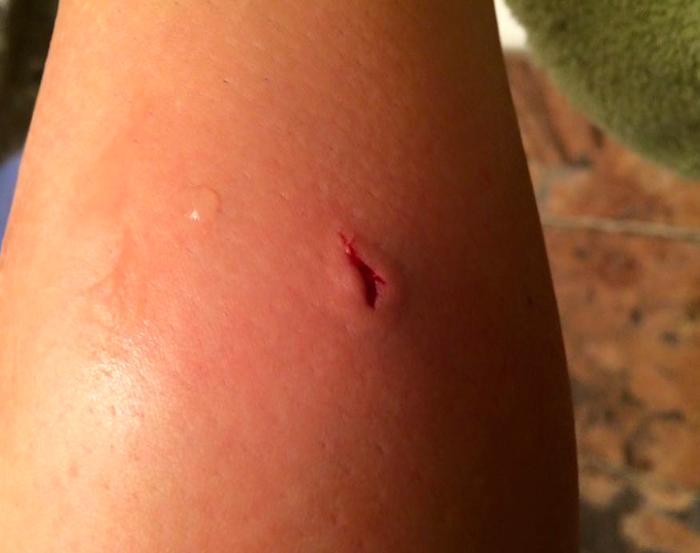 Do not go outside with an unpredictable aggressive pig in flip flops or clothing that leaves skin exposed. Be prepared to battle it out. I cannot stress this enough....You can't walk out there and then turn your back and run away from a pig that has aggression or territorial issues, by allowing him to provoke a reaction by you only reinforces the aggressive behavior and his ability to control YOUR movement. You have to stay and stand your ground until the pig walks away. I have stood outside, especially on the weekends, when work wasn't an interruption, for HOURS while Huckleberry would act out aggressively. I knew I couldn't walk away, I knew if I did, he would "win" and I didn't want to keep having to do this. There were some days I was covered in sweat because it was so hot outside and I had to stand out there with a heavy sorting board until this mean pig backed down. Some days he would jump up onto the sorting board and since he was almost as tall as I am, when he stands on his back legs, it was scary, I would tip the board in his direction so he wouldn't be able to stand on his hind legs and hold onto the board I was using to protect myself and I would take the board and repeat the word "BACK!" as many times as I needed to until he backed up a few steps. I used the board to direct him where I wanted him to go. In reality, the goal of a sorting board is not to push them, but to lead and/or them to follow willingly. This takes time, practice and an understanding of how a pig is thinking in order to accomplish this. It doesn't happen overnight, it is a process and takes some time. Keep in mind, the behavior didn't happen overnight and it won't be corrected overnight either. You have to have patience and a desire to work with an aggressive pig in order to get it done the right way. Please keep in mind, you feel your frustrations, but your pig is also frustrated. We continued to be proactive and pen him when needed or when there were known people that would be in my backyard such as yard cleaning services or air conditioning repair/maintenance, for example. With Huckleberry, he would nudge the bottom of the board and if I didn't have my foot there to stop it from moving, even a fraction of an inch, he would get hyped up and start it all again if he was able to push the board back even just that tiny bit. That seemed to turn him into a super aggressive pig. If I would hold my foot right where he was going to push and he wasn't able to move the board at all, he seemed to calm down a lot quicker, I learned to watch his feet so I would know where he was going to push on the board. By trying to anticipate where he would push, I was able to cut 30 minutes off of the amount of energy I was exerting when fighting/working with him. Another method that was eventually added to our retraining process was that I made the first move. I was now in a position to control his behavior was NOT letting HIM be the one in control. I didn't give him the opportunity to start acting aggressive, I created a situation where he had to react to MY motions. I went out there and used the sorting board to make him move and in turn, he would start chomping and challenging the board. Ultimately, it was the same thing he had been doing to me, only now, I was proactive and made him become reactive instead of the other way around. This helped because for the first time, he wasn't in the drivers seat, I was and now he had to react to my initial actions and I wasn't reacting to his. This seemed to be the turning point for us. I would even sneak outside so he wouldn't hear me and although, not intentional, I would scare him just to provoke a reaction. By me controlling when he would be aggressive, I also became the person that he respected. I didn't allow anyone else in my family to interact with him, although normally, we want the entire family to be involved with training, this isn't the case with a super aggressive pig who is actively attacking or trying to. It is NOT recommended that you allow ANYONE who doesn't possess the skills needed to deal with a pig like him. It is dangerous and irresponsible. It is completely appropriate if you seek the assistance of someone who has experience with these types of pigs though. Believe it or not, I wouldn't do anything any different. They say experience is the best teacher and I feel like a self proclaimed expert at this point. Once I mastered the art of sorting panels, I started working on calming him down. I found that he would act calm if I was kneeling down or on his level, he did NOT like someone standing over him. This makes sense to those who have pig experience. Hovering over him suggests there is a threat of some kind waiting for an opportunity to attack him, because he doesn't realize I would not hurt him. As far as he's concerned, I am not only the food person, but also the treat dispenser and sole caregiver for him. So, with the sorting board in hand, I would reach over top of it and rub his head and ears while telling him to clam down in a soothing voice. (If a pig is on his way to being a good pig, its appropriate to use your hands to try and do this in order to gauge his response. Some pigs do great with this, some pigs do not feel comfortable with the loving hand of a human touching them. I can only assume he was abused at this former home because overtime I reach up to put my hand over the board to make physical contact, he steps back a little. This would be the ideal time to use the extendable fork (found at Spencers stores at most malls or the extendable back scratcher found at discount stores nationwide) As the chomping stopped and his mohawk went down and I could see that he was calm, I would kneel down and reach around the side of the sorting board to rub his belly. He would tip and that fight would be over. Typically, at this point, I could walk away when I was done with this interaction without him following me. But it wasn't always that easy. Some days, especially in the beginning, he would follow me anywhere I went. Picking up pig poop was really quite a chore with an aggressive pig following you around the yard and attacking at any opportunity. Carrying a heavy sorting panel, plus a bag of poop and the rake and scooper was hard to manage. (I learned to be a pro at pig poop pick up though and multitasking). But since he had periods of calmness, each day became less and less fighting/battling with him. ​Eventually Huckleberry adopted this new routine and adapted to our home and the way we operated. Around 7pm, Huckleberry goes into the poolhouse to sleep. Around 830pm, I let him in to go to his crate and go to bed for the night, I now have to zip tie the crate because Huck likes to see how far he can bend the door out and play Houdini pig, but again, we have learned each other now and until I find a crate that is stronger (because he has broken a total of 4), we will work with what we have and since it's currently working, we will continue until it no longer does. So after 7, anyone can go in the backyard because he's not getting up until I go to get him to go to bed in the house for the night. During meals, he doesn't display any aggressive behavior, whenever he is let in the house at any time of the day, he doesn't display any aggressive behavior. Huckleberry had the classic territorial aggressive behavior problem. What he needed from the beginning was to be neutered and trained. A neuter would have likely allowed him to stay in his first home. By this point, Huckleberry wasn't perfect, he still had the occasional moments when he acts like a crazy pig with a bad attitude, but far from the pig he was 4 months ago when he first came to our home. Eventually, I penned him again with the hopes that absence makes the heart grow fonder, only this time, I believe this did have a positive impact on him. I would go out only a couple of times a day for a week over and above the feedings and just sit and talk to him. He would always come to the gate and allow me to pet him, usually he would tip right over requesting a more extensive belly rub, but I wasn't able to do that through the small homes in the gate. Ultimately, I do believe this was partially part of the reason why he calmed down and started to show some respect for me. He finally learned that my intentions were good and I was NOT trying to hurt him. Now is the time to start training your pig. That was my next step in the behavioral modification plan I had in store for him. Teach this pig to sit or spin or stay. Not only does this reinforce your position in the herd, but also promotes positive reinforcement. If your pig is still having the occasional outburst of undesirable behavior, keep your sorting board handy too. Keep it in front of you, if you need to, but if you don't work on training this pig, things aren't going to improve as much as you likely want it to. Lack of training for these pigs is part of the problem to begin with. Your pig is only as good as you train their pig to be. A great pig is a great pig because of great training! Work on tricks using treats as a training tool and praise this pig for being a good boy (or girl) and make sure he/she gets a reward. Reward them for everything positive. Coming to you when called and not acting aggressively? Reward. Walking outside without any unprovoked attacks? Praise and reward. They need to realize what they're doing good and what is undesirable. They cannot make this determination without your approval of their behavior and actions. Just remember, as frustrated as your are, odds are, your pig is too and possibly even more frustrated. It takes a special person to work with an aggressive pig. It takes a lot of encouragement and you literally put your blood, sweat and tears into an animal with aggression issues. It is definitely not an easy or quick process, but you have to maintain consistency and leadership. Even though the behavior seems to subside, you may find that your pig has a trigger of sorts, may be a pair of shoes or a particular color you wear that your pig must be associating with some kind of traumatic event in their lives, you may find when you wear a certain perfume or make a certain motion with your hands that causes your pig to get flustered or start acting aggressively again. You will need to watch your pig to figure out if there are any triggers. You might not have anything like this happen, but you should be prepared in case you do. Keep a video or even handwritten journal of the events. Write down steps you have taken and what kind of response you got when doing this. When looking back, I could see where the problems were. There were certain things my pig wasn't a fan of, such as me hovering over him. You may find part of this helpful or your pig may present with a different challenge that needs to be handled completely different from this pig, take what you can use and apply it. There is never just one way to do things. I modified what I was doing on a daily basis. I used Lydia Weaver's move the pig technique with Dawn Camp's advice along side of Rose Parkers words of wisdom plus my own flair. You can apply what makes sense to you and your particular situation. You may use this as a guide or you may use this as a behavioral bible, so to speak, but you may only use this for one day and then figure out something that works better for you. Your pig is NOT your boss and your pig needs to know that. NEVER EVER HIT YOUR PIG!!!! NEVER, under any circumstances lay your hands on your pig in anger. NEVER allow someone else to mistreat your pig. NEVER let someone with a short fuse work with your aggressive pig. Do NOT set your pig up for failure, do NOT expect this to be fixed in a day or a week, sometimes correcting this long term behavioral issue takes months. Do NOT give up...These kind of issues CAN be fixed, You have to be patient and dedicated and work with your pig constantly to fix this. If you need help or guidance, let us know, we are more than happy to help you, guide you, put you in touch with others that can give you guidance and support. You are not alone, there are many people out there with aggressive pigs or experience in dealing with one who may be able to offer life altering advice. Just know with hard work and a desire to change things, you can! Huckleberry was one of the lucky pigs, I have seen others dump their pigs at a shelter or give them to people they didn't know only to later regret that decision. Don't be the person who "can't deal" with your pig or your pigs behavioral problems. Especially intact pig problems. YOU are to blame. There isn't a way to sugar coat that, it is directly your fault that you failed to spay/neuter your pig and/or train your pig. 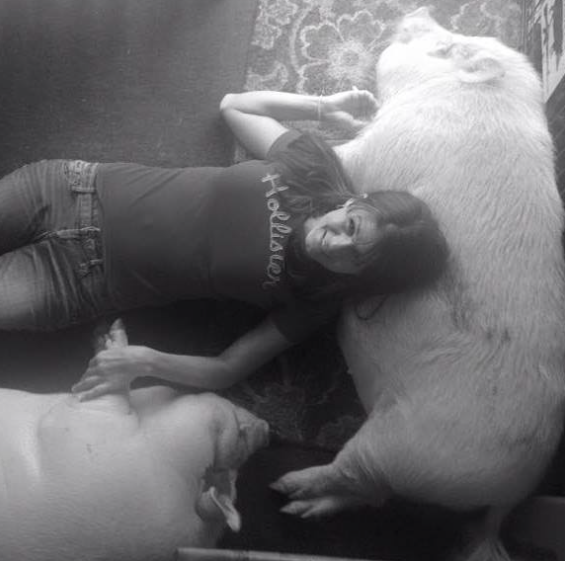 Work with your pig, train your pig, teach your pig to respect you and others. Correct your pig when your pig isn't on his or her best behavior....If your pig acts like a jerk, that's YOUR fault, not your pigs fault. They can only learn what is taught to them. They don't just pick up on things you would like them to do or act in a way you want them to act, they have to be taught how to behave and what your expectations are. Counter conditioning is a new approach to dealing with aggressive pigs. It is changing the emotional state versus correcting or scolding the inappropriate behavior. Positively pigs is working on a series of videos to demonstrate how to use these methods in dealing with aggressive pigs as well. (See one of the videos at the bottom of this page) This makes complete sense to me, but I do not believe this is the best method for an intact pig, it IS appropriate for a pig who is NOT intact and having aggression issues though. If your pig is upset, your pig will likely act out. Their emotional state is upset. YOU can change that and by doing this, you are creating a happy place for your pig. Huckleberry was finally the great pig I knew he could be. Was all of this easy? Not by any stretch of the imagination. Was he difficult? Absolutely. But, he was a great pet and made a family EXTREMELY happy! Huckleberry is one of the pigs who was given a 2nd chance, one that wasn't euthanized because one person didn't give up on him. One person that cared enough about him to give him that chance. If you are dealing with an aggressive pig or one with behavioral issues, stop and make a plan. Plan what your moves are going to be and if something is not working, try something else. 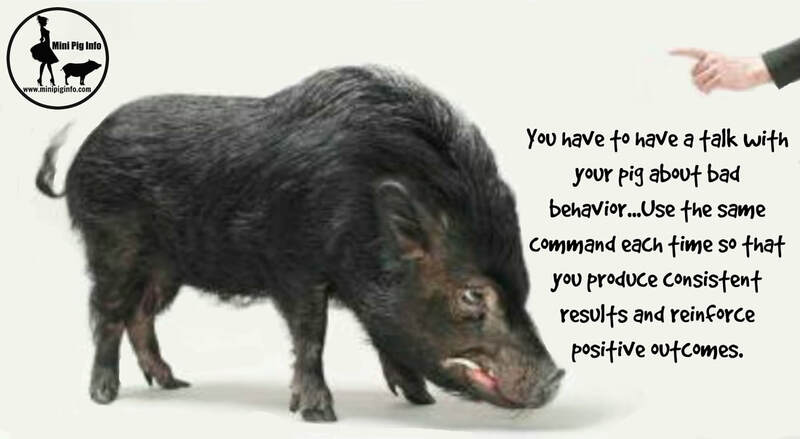 Each pig will be different in the way they react to your commands, discipline, and demeanor. Try different methods until you find one that works for you, your pig and your situation, but don't give up hope. Your plan will most likely be different from my plan. Your pig may act out for different reasons, but you need to find out why and address the underlying issues first. Working with an aggressive pig is hard enough, but once you feel the main threat is gone, using training, such as sit, spin or shake hooves can compliment and reinforce the more difficult aggression redirection/training. This provides you with a pleasant time to bond and work with your pig using positive reinforcement to reward accordingly. Above is sit, mastered in less than 10 minutes. 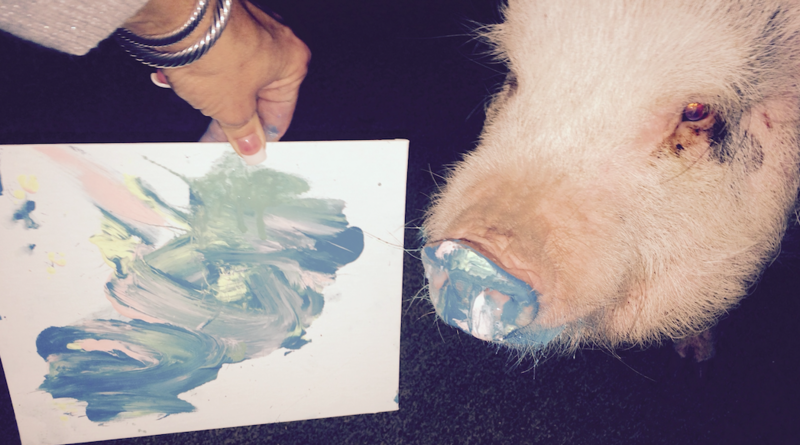 Huckleberry also did some therapeutic snout art for an upcoming auction for a pig charity. These are simple things you can do with your pig in the way of training or generally working with them one on one. Praise good pigs often, let them know they're being good pigs. Know your pigs likes and dislikes. Try not to overstep your boundaries with this pig for a while. Build on the relationship you have created. Nurture this pig and show I'm/her that they're a loved member of your family. Definitely not perfected, but this is a huge milestone for the simple fact he was willing to do this. And his painting was awesome. This is the same "vicious" & "dangerous" (as some others have claimed him to be) pig several months later. Sweetest pig EVER. These kinds of pigs can be retrained, he is proof of that. Suggested treats are anything low calorie you'd give any other pig, BUT, ONLY give treats for positive behavior. Do NOT reward negative or bad behavior. Supplies: #1 is a sorting board or sorting panel. You can get one at Hogslats.com for a reasonable price. #2 is rubber boots. They don't need to be fancy, you want to cover as much of your foot and leg as possible. The following video is one that hits home for me, this is Gilbert the pig who also had some behavioral issues. Gilbert was also not neutered, but Gilbert was hateful before and after his neuter as many pigs are. Note the original family not properly working with him. Yelling and screaming obscenities isn't something your pig understands. This is not how pigs communicate. But that pig knows the man in the video is upset, frustrated and unprotected. Gilbert went to live with Dawn at Camp Skipping Pig Rescue and has transformed into a kind and gentle pig that anyone would love to have. These aggressive pigs can be retrained. Please don't give up. Let us know if you need help or tips and we will help you work through the problems you're having. These are Gilberts "before" and "after" videos. Thankfully he is at HOME now with Dawn. But another success story. And another INTACT pig who had hormonal aggression. PLEASE spay and neuter your pigs!!!! If your pig isn't normally an aggressive animal and suddenly becomes aggressive? There is likely an underlying issue why your pig suddenly is being mean. Check your pig for a fever, behavioral changes are usually a result of a change, sometimes of an illness where there may not be visible signs of your pig being sick other than a behavioral change. Is there possibly a UTI? Collect a sample of your pigs urine (and this can easily be done by holding a soup ladle under or behind your pig, mid-stream, and placing the freshest urine possible in a clean container) and taking the sample to the vet for testing. A fever indicates there is something the body is trying to rid itself of, if there is a fever, but no signs or symptoms of an infection, is it too hot? Could your pig be suffering the effects of being overheated? There could be an infection somewhere that you can't visibly see and your pig will need to be seen by the vet. (A fever greater than 104 needs to be addressed urgently) Rule out health problems before labeling your pig "aggressive". Sometimes a pig needs a friend. Pigs need other pigs because they're social animals. If your city restricts the number of pigs you're allowed to have, try to address that with your city. Determine if there is a way to get a waiver or ask for the city to amend their ordinance. We can provide you with scientific research studies that prove pigs do better in pairs. They can act out in a negative way because they're bored or you simply don't understand what they are trying to say. Maybe you don't have the time your pig needs for interaction purposes and a second pig could provide them with the companionship they are seeking. Another reason a pig may be suddenly aggressive is because they're surprised. Pigs have poor vision, but much like the elderly humans, everything declines with age. Vision doesn't improve with age, it gets worse and with pigs, especially those who are overweight, this most definitely impacts their everyday living. So if you notice approaching your pig from one side seems to surprise him/her, the vision on that eye may be failing or worse than the vision in the other eye. Adjust the way you do things to approach from the good side only, if possible. Same goes for hearing, morbidly obese pigs can sometimes go deaf or become hard of hearing from fat, much like fat blindness, the ears actually move more to the side instead of being upright and standing tall. These pigs have difficultly hearing and if asleep, can be surprised when awoke by someone touching them and can sometimes be misunderstood as being aggressive when they're simply scared. You can check preliminarily for yourself by whispering in each ear to see if you get the same response, approach your pig from both sides to see if the vision is better or worse on one side or another and then get your vet involved and express your concerns to see if there is anything that can be done to improve this situation. Hungry pigs can be misunderstood as aggressive pigs. There are those who are underfeeding, usually as instructed by someone who has no business giving feeding instructions to keep their pig smaller, and just like people who may get agitated when they're hungry, so do pigs. Make sure you are balancing the diet with activity levels. This is cruel to try to starve any animal to keep them small (and in my opinion, abuse) but you cant complain that an animal is aggressive when they're simply trying to let you know in reality, they are starving. You can likely correct this by adding more food to the diet and/or changing the times you're feeding your pig. You know your pig, just know if something is unusual, it may be the beginning stages of a "spoiled pig" or there may be an underlying issue that needs to be addressed. Never assume your pig is just being a jerk, the pig may be trying to tell you something is wrong. A sow will at aggressively to protect her babies too, this is the same in feral and domesticated pigs. Mothers naturally protect their offspring. Even people who know their pigs well have been surprised when a mama pig has bitten them as they're walking by. Valerie Tynes, DVM did a study on pig aggression and how often it's seen in homes with pigs. You can read her aggressive pig research publication here. (uploaded file below) Click here to read more about "spoiled pig syndrome" which is slightly different than aggressiveness, but does share some of the same components. You may not be able to tell from this picture, but you will see in the short video clip, this pig is blind. He is only able to see shadows...had the owner not noticed this and adapted her interaction knowing he had this disability, he may have been mistaken for an aggressive pig because he wasn't able to see her approaching. He has bitten her when she's accidentally scared or startled him. Thank you Lisa Corbett for allowing us to use your sweet baby's video to show others how visually impaired pigs have challenges of their own. Contacting a behavioral consultant is also a great idea as some of these people have trained for years and years and worked with many different animals and personalities. They also realize that there isn't a one solution fits all kind of fix for this problem. Susan at Ross Mill Farms is a behavioral consultant as is The Animal Behavioral Center. Make a call and find out out these services can help you. There is also newer information out there about using dominance as a way to control your pigs behavior and how this may not work for some people. Before you get frustrated, because the commonly suggested solutions aren't working, please connect one of the people we mentioned earlier or contact us and we will try and help you or put you in contact with a behavioral consultant. Another great site to look at is called positively pigs, they have a fresh outlook on behavioral issues and a different approach on how to deal with them. There is no one way fixes all plan, each pig will be different and react differently to the situation as well as the repercussions. You may have to try several things until you find a solution for your particular situation. Don't give up, do work on it and eventually, you will find the good pig even if its hidden down deep.